Hayman are inviting ladies to book a trip away in May with Mum or a group of girlfriends. Spa Hayman will offer a complimentary 30-minute Refresher Facial to guests booking a 1-hour Massage or Body Treatment, and a complimentary 15-minute Makeup Touch-Up for guests booking a 1-hour Facial. Every weekend throughout May, a glass of sparkling wine will be available to shoppers from 3.00pm at all Hayman outlets whilst guests look for that special purchase to take home. Hayman Escape packages are priced from $932 per person twin share including 4 nights’ accommodation and daily beachfront breakfast. 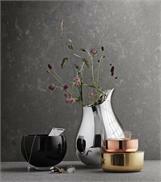 Georg Jensen have unveiled a new range to enhance our everyday lives with the Ilse Collection. British designer Ilse Crawford is behind the namesake collection. Known for her warm aesthetic, Ilse has designed an extensive roster of interiors and products through her firm Studioilse, including New York's Soho House Group. Ilse uses solid copper, brass and black glass, to bring a warm and sensual materiality to the living collection. The range comprises two vases in two sizes, two bowls, three boxes and a candle holder. Each piece is designed with a specific function in mind, but can easily be adapted to whatever the user needs. The Ilse collection is available in-store now. Your Chance To Fly Free - Could It Be Your Lucky Day? In an exciting first for Qantas Holidays, all passengers who fly out on one lucky day of the month will get their flights absolutely free. Whether it's a short flight to Melbourne, or a business class fare to Dallas Fort Wort, all fare levels are applicable for this massive draw, giving travellers an incredible opportunity to book their holiday and get their money back, allowing for bonus spending money on the side. The FLY FREE competition is open to all travellers who book their holidays in May and June with Qantas Holidays. On July 5 a date (number between 1 and 31) will be randomly selected and anyone flying out that day will have their airfares refunded in full. The free flights will occur over 6 months from May to October.